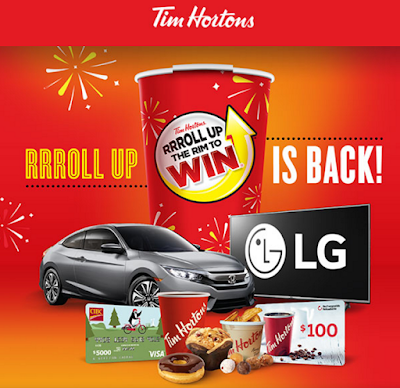 The Tim Hortons RRRoll Up the Rim promotion is back. No purchase necessary. Game ends on April 14, 2017 or while contest cup supplies last, whichever occurs first. All prize claims must be redeemed by May 04, 2017. For no purchase entry, send a postage paid, self-addressed stamped envelope to Tim Hortons RUTR 2017 Contest Cup & Rules, PO Box 13798, Saint John, NB E2L 5E7, which must be postmarked by April 14, 2017 and received by April 24, 2017. Only open to residents of Canada. 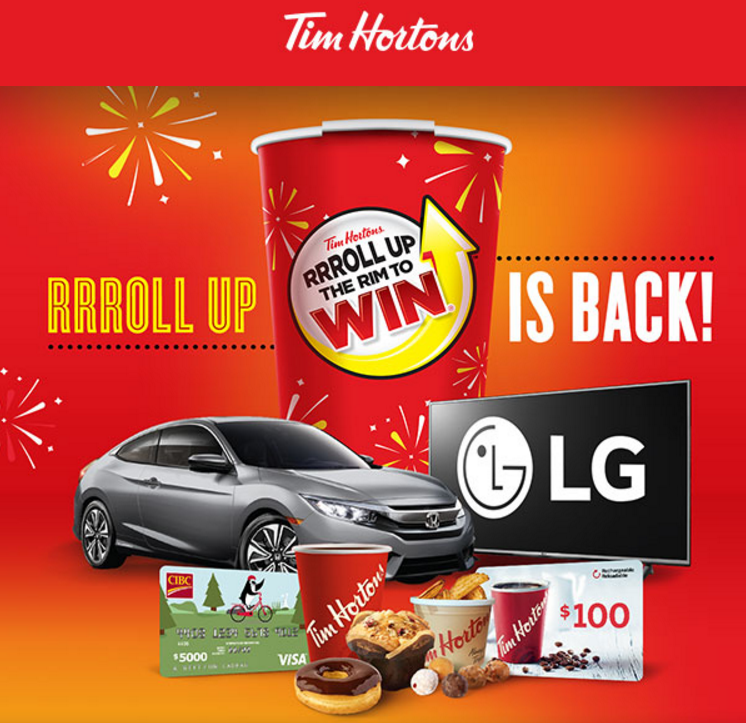 PRIZES are regionally distributed across Canada: 40x 2017 Honda Civic Coupe EX-T vehicles, approx. odds at outset 1 in 7,498,772, approximate retail value (“ARV”) $23,290 CDN each; 150x 55” LG 4K UHD TVs, approx. odds at outset 1 in 1,999,672, ARV $1,599 CDN each; 24,000 x $100 Tim Cards, approx. odds at outset 1 in 12,498; 100 x $5,000 CIBC Prepaid cards, approx. odds at outset 1 in 2,999,509; millions of Coffee and Food Prizes, approx. odds at outset 1 in 6, ARV $0.70-$4.29 CDN each. Total ARV of all prizes is $77,571,230 CDN. Correctly answered skill-testing question required. Prizes may not be exactly as shown.